What better way to end a summer’s day on the beach than with a BBQ! So you’ll be pleased to know that the beaches of Bournemouth and Poole allow you to do just that. You can have a BBQ on the beach after 6.00pm but please note that only charcoal or gas barbeques can be used, no open fires are permitted. In Bournemouth disposable BBQ’s can be left beside the plastic bins along the promenade. Please ensure that you dowse hot coals first. Alternatively Bournemouth Council have provided a number of cinder bins which are located at Solent Beach (eastern most end near Hengistbury Head), Boscombe Beach (between groyne 24 and 25), Bournemouth East (opposite the base of the Toft Zig-Zag pathway) and Alum Chine Beach between groyne 3 and 4). For BBQ’s of more that 30 people an application must first be submitted to Bournemouth Council. 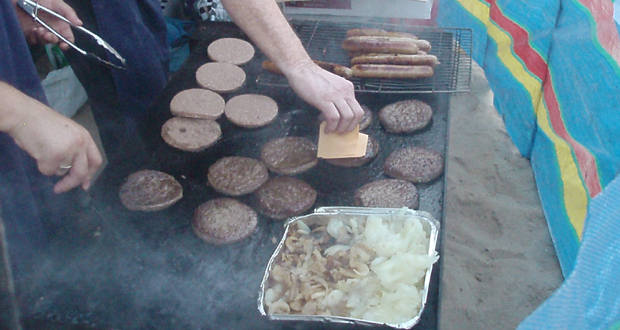 If you’re unsure of where you can have a BBQ please contact the Seafront Office on 01202 451781. In Poole you can hold a barbeque on the beach for groups of up to 12 people from 6.00pm. For parties greater than 12 people permission must first be sought from Poole Council 7 days in advance and these barbeques can only be held in the designated areas which are at the western end of Sandbanks Beach and at Flaghead Chine. Hot ashes can be left by the plastic bins, please do not put hot ashes in the bin. When having your barbeque please choose your spot carefully, keep noise to a minimum and please, please help keep our beaches beautiful by ensuring that all rubbish is disposed of in the nearby bins or taken away with you. Do not bury any rubbish or remains in the sand and finish your barbeque party by 11.00pm. BBQ’s cannot be held on Lake Pier beach.